I am fortunate enough to share my birthday with the feast day for one of the most recognizable saints in the Church Triumphant – Saint Patrick. That means my birthday often finds parades and parties, with many remarking how lucky I am to have such a great birthday. Even more great is the fact that I am still here, writing this post… I was born very premature, with my weight getting down to around 1 lb 9 3/4 oz before I started packing on the ounces and pounds. The picture to the left is my mother talking to me through the isolette shortly after my arrival. I am grateful for the fact that I don’t have any significant physical or mental disability. I am thankful every day for my parents, that they are there for me. I am thankful for every day of my 34 years. I always bristle whenever people say that I am lucky. I don’t believe in luck. 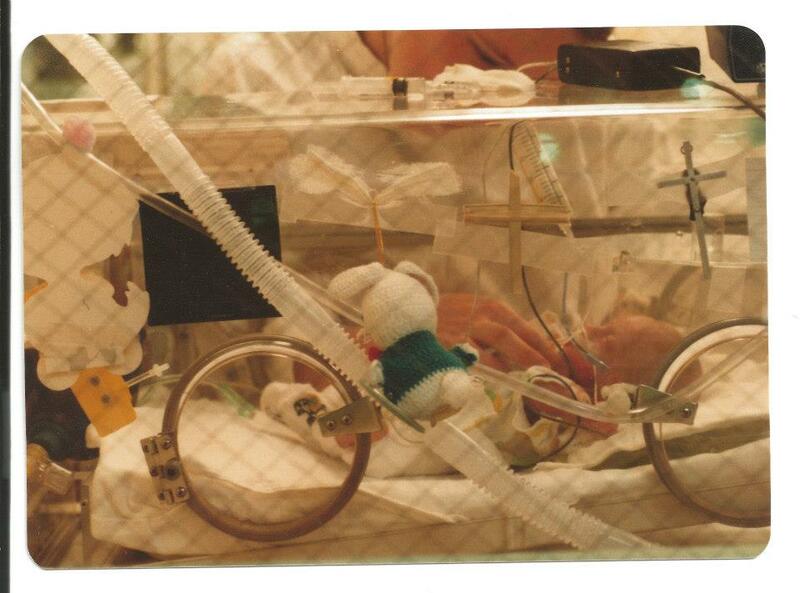 I think about the other children in the NICU with me during that time, many of which never left intensive care. I’m not more lucky than them, it just wasn’t my time yet. I like to think that I have some sort of purpose left to fulfill in God’s plan for salvation. I believe in the power of prayer, and I believe that is a large part of why I am still here now. Every year about this time, my grandparents, parents, and aunts call and often they remind me of how scared and how much they prayed for me when I was born early and fighting for my life. Thanks to good doctors, these prayers, and the grace I received at my Baptism – I am still here. The world contains too much pain, suffering, and uncertainty in the world and there are also too few helpers. Just this week I have seen several friends of mine very ill, impoverished, depressed, and at their wits end. What I really want for my birthday this year is more helpers. The emotional toll of working in the homebound ministry can sometimes be very challenging. So here’s what you can do for me: pray. Pray for me, pray for my ailing and homebound friends, pray for those you know that are sick and in distress. Pray for radical conversions in the hearts of your friends and family. You can do this even if you do it every day, or if you haven’t done it in awhile. It doesn’t cost a thing and it helps more than you know. Share this request around… the more prayers the better. Second, if you can… help. Surely you know of someone sick or homebound that would appreciate a phone call or a nice card. If you know someone that is struggling with money and you can afford it, help them. If you know someone spiritually poor, reach out to them. Over the past few years, I have learned to appreciate how much small actions mean to people that are struggling. I would appreciate it very much if you remembered my birthday by helping someone in this way… but I would appreciate it even more if you made a habit of it. Thanks to everyone that has made my life great up to this point. Hopefully, I’m just getting started. This week, I began a new program at our Knights of Columbus Council that encouraged all Knights to participate in very simple activities that add up to meaningful change. I asked each man to bring canned food to the next meeting or they could pray a rosary for the intentions of the homeless and hungry of our community. We ended up collecting 105 items for our parish food bank. Every night before bed, I bless my two and a half year old daughter. I trace the Sign of the Cross on her forehead and say “God Bless You”. She usually says “Thank you, Daddy”. I don’t know when she figured out to thank me, but it is a constant reminder of what a great gift my child is. 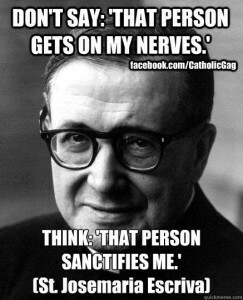 I make time to say a few silent prayers before particularly stressful meetings at the office. If possible (and weather permitting), I sometimes take the walking trail around our office building and pray a rosary. This was particularly helpful during the 33 Day Rosary Challenge and I found that it was a great way to de-stress and face the second half of my work day. One of our parish deacons recommended that I end every day by thanking the Lord and praying that my own sacrifices are pleasing to Him. He explained that we often forget that the daily sacrifices such as patience, prudence, time spent at work, time spent for the care of others, and time spent in prayer are all done as sacrifices for the Glory of God. I find that I often remember to pray in this fashion right as I’m closing up the house for the night, and associating it to a necessary task that I do every night makes it an easy practice. My wife has taken to reading the Magnificat every night. Sometimes we talk about her readings, or she shares something that she thinks may particularly help me. It’s a great way to reconnect and worship together. There are also several electronic avenues to deepen your spirituality daily, such as the Catechism in a Year program at FlockNote where they email a small segment from the YouCAT to your email inbox each morning. I keep coming back to the simple ways that you can help others as a part of your faith life. I am confident that your parish has outreach programs, charity programs, RCIA sponsorships, and a myriad of other ways that you can help your community. The Knights of Columbus are a great avenue for practical Catholic men to find new opportunities to give back. I intend to continue posting the subject of our Simple Ways program here. If you like the activity presented, I encourage you to participate by mirroring the activity at your local parish, Knights of Columbus Council, or local charity. For the month of August, we donated canned food to our local parish food bank. If you couldn’t do canned food, prayer counts: pray a rosary for the hungry and homeless of the world. If you do decide to participate in the Simple Ways program, send me a short email or leave a comment and let me know how you participated (you can remain anonymous). If your Knights of Columbus Council is participating, please let me know your council number so I can mention it in our annual program round-up.